Ben Cardin, born October 5, 1943 (age 75), is a United States Senator from Maryland. He is a member of the Democratic Party. Cardin served from 1987 to 2006 in the United States House of Representatives until his recent senatorial election victory over former Lt. Governor Michael Steele. As a representative, Cardin was a ranking member in the House Ways & Means Committee and also the Trade Subcommittee and the Helsinki Commission. In 2001, he was named by Worth magazine as among the top "100 people who have influenced the way Americans think about money." 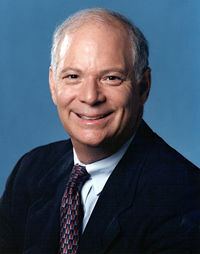 Previously, Cardin was chosen to become the youngest Speakers of the House in Maryland history, a position he held for eight years. This page was last modified on 27 June 2016, at 19:15.